Ever heard of Country Bob’s? It’s not a country song or a little general store. It is a brand of the most delicious All purpose sauce. I started enjoying Country Bob’s back in 2003 after I was introduced to it by someone I knew. He had been enjoying it much longer. It was an instant hit with me. I have never been too big on steak sauce but I love Country Bob’s all purpose sauce.Look for Country Bob's All purpose sauce at your local grocery stores! When I was pregnant I drank it straight from the bottle. True story. Something else that I really like about Country Bob’s; it is a Christian based company. It is really refreshing that there is a company out there that is not only making great products but are serving the Lord while doing it. It is awesome to see a company with such great wholesome values. Country Bob’s has other products besides the all purpose sauce. They also have seasoning salt, BBQ sauce, and for those brave folks a spicy all purpose sauce. There are all kinds of delicious recipes on their website. When I look through the recipes my mouth waters. Country Bob’s was created by Country Bob Edison in 1968. After giving his sauce to friends and family for quite a few years he began to sell it in 1977. Country Bob’s Inc wasn’t actually a company until 1982. Where Bob and a few friends went in to business with equal ownership as it remains to this day. Those who try Country Bob’s all purpose sauce become live long users. Just ask me I have been using it for 6 years now. Country Bob’s has grown so much since it was created in 1968. They have not forgotten the where they came from and the excellence of a quality product. If you were to ask them where the credit for Country Bob’s was due they would say the Lord. The Lord is their CEO and the whole success of the company is and always will be in the hands of the Lord. 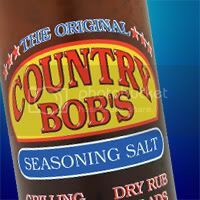 I had the opportunity to try some of the Country Bob’s Seasoning Salt. I love seasoning salt. Some people think that all seasoning salts are the same. In my opinion they are not. I can tell the difference between good quality seasoning salt and not so great ones. Country Bob’s Seasoning Salt is so delicious. It comes in a big bottle so you will get a lot for your money and you can indulge in whatever amount suits your taste. It is full of flavor. It provides just the right blend of seasonings together for a taste that the whole family will enjoy. It’s a quick, easy way to change food from ordinary to special. Thank you to Country Bob’s for the opportunity to sample some Country Bob’s seasoning salt.